“Are there not many holy places on this earth? On the physical level you will experience the adventure of staying in the city that has for millennia held the central position in the most ancient spiritual country on earth and visiting its most important vortexes of spiritual power. On the social level you can enjoy the exhilarating spiritual intimacy of satsang, connecting in community, kirtan and celebration with a new part of your sacred family. And you move among the Indian people who are much more transparent to the presence of soul than we are in the West. Mentally you can learn many things, among them the practice of ‘The Work’ to free your mind of stressful thoughts. You will also discover many secrets of the Gods in the Indian pantheon, and how to evoke these aspects of your own enlightened mind so grace can awaken in you. Emotionally, you can discover how to bring yourself into harmony with Open Attention and experience the practical use of the unlimited power of love to heal and nurture you. Spiritually you can enjoy the unique ambience of the sacred Ganga and the City of Light. You can open to the experience of the deities as windows into higher reality or mirrors of the true Self. In this way the divine world becomes a portal into the Absolute, beyond birth and death, the liberation into the timeless space of the fully awakened heart. Varanasi is extraordinary in its spiritual depth, its stirring aliveness, and the grace and blessings that can be received here. Even more extraordinary is the vast expanse of the core of your own being, the inner Source of your Love, the radiant Self in the Cave of the Heart. In this HeartSourcing retreat you will experience both. We integrate the inner and outer, known and secret Sources of Yoga and consciousness. We enter the world of the Gods, the living, awe-inspiring aspects of your enlightened mind. We train heart and mind to encompass new joyful dimensions of being. And we give you the critically important skills you need to establish yourself in a higher and happier dimension of being. This is an adventure for yogis and spiritual seekers, not a tourist vacation. Our goal is to go deep and have you bring home truly transforming experiences, a new admiration and shining love for yourself and all life, and a firm foothold in a higher and liberating awareness. WHAT IS A HEARTSOURCING IMMERSION? Our retreat offerings take you to the most sacred places of India, sanctified by the presence of sages and siddhas who have graced this land and its people for centuries. We meet in places of extraordinary beauty, serenity and spiritual energy that can effortlessly guide you to your pure and limitless inner core and a richer, more connected life. Immersing yourself in this inspiring experience will intensify your inner process of awakening and more firmly establish you in your true love and wisdom. Open Attention, to heal emotional edges and to nurture your entire being. Ramgiri has cultivated his understanding and realization of spiritual reality for five decades in East and West, and he is an eminent guide into this world of the sacred. He will be offering satsang during in the context of this retreat. In these informal sessions you can get your questions answered, receive personal guidance, and discuss all dimensions of your Varanasi experience. His support will help you to unlock ‘secret’ or esoteric aspects of the inner world of yoga and the Gods, which would otherwise remain hidden. Durga has cultivated the practice of Bhakti Yoga (the yoga of devotion) through Kirtan, and the practice of Hatha Yoga (asana, pranayama, mantra practice & meditation). 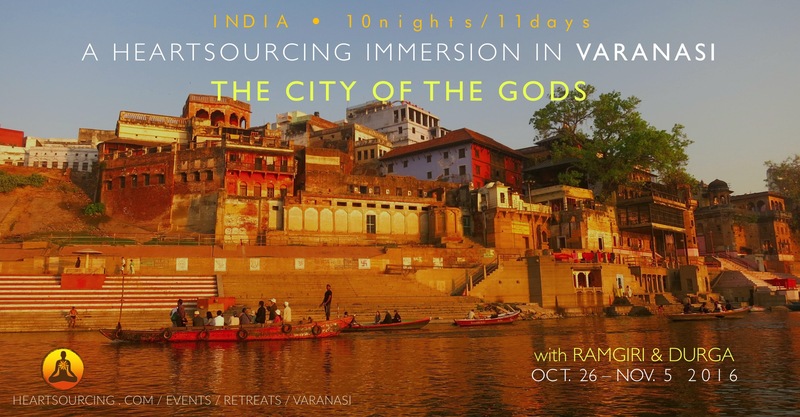 Both, Ramgiri and Durga, will be leading this Immersion in Varanasi as well as guiding you through the different pilgrimage destinations around the city. We will stay at Shri Yoga Mandir Ashram, a Ganga river view guest house and ashram for yoga practices. Clean, quiet, beautiful garden, lots of light and air flowing through, near to Assi Ghat. The ashram is owned and run by a local Brahim family. Modest accommodations in AC rooms with en suite bathrooms for two people. Registrations are open until Oct. 1st, 2016. Please complete & submit the form below and process your payment using the PayPal button. Payment in U.S. dollars by check, PayPal or credit card can be made. Please select from the option below if using PayPal or credit card. If you want to pay be check please let us know by sending us an email to info@skillsforawakening.com. This plus the full retreat payment will complete your registration process. Since we have a limited amount of spots available, the retreat registration is on a first-come-first-served basis. For cancellation policies, please refer to the TERMS AND CONDITIONS below. Until 8 weeks before the start of your retreat 100% refund, minus the deposit. 4 to 8 weeks before the start of your retreat: 50% refund. After 4 weeks before the start of your retreat 0% refund will be given. You may cancel your retreat at any time providing that the cancellation is made by the person submitting the booking form and is communicated to us in writing to info@skillsforawakening.com. Cancellation will take effect from the day it is received by us. Once the retreat has commenced, no refund or part refund or unused portion of the retreat will be repaid in the event of cancellation by you. Due to teacher cancellations or any other situations outside our control, we reserve the right to make any changes to our program. Alternative arrangements will be offered but we do not accept responsibility for any costs incurred, including airfare and travel plans. In the event we, Ramgiri and Durga, need to cancel the retreats, you’ll be refunded 100%, minus a convenience fee.